Our third Sunday on the road. Light morning traffic. We stopped at a supermarket for orange juice. 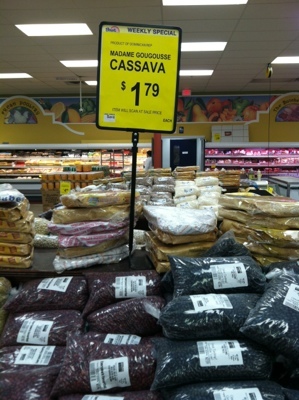 The market carries some ethnic foods. Casava, OK. 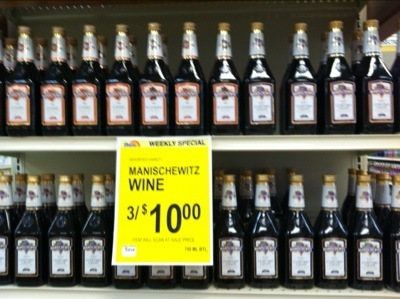 But Manischewitz? Jeffrey asked cashier Luz. 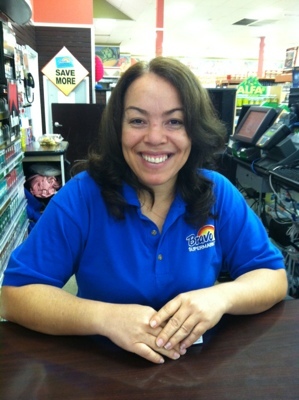 Luz said that Manischewitz is similar to wines popular in her native country, the Dominican Republic, and in other countries also. She and Jeffrey talked from experience about the U.S. immigration system. Jeffrey mentioned an article in this morning’s New York Times about how more evangelical churches are beginning to adopt a Christlike attitude toward strangers, a significant change from the all-too-common harshness we have remarked at before. (See, for example, our post from the Ride to Nashville, Stopped Into A Church …, and from the Ride to Postville, In God We Trust.) Maybe our country is turning a corner. Luz and Jeffrey hope so. 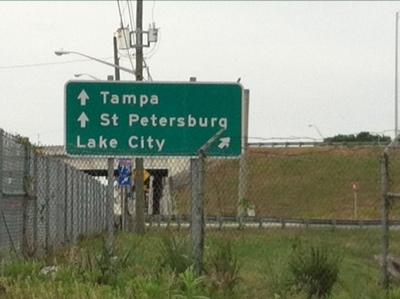 Soon we saw a sign naming St. Petersburg! And this. Who commissioned it? What does it mean? 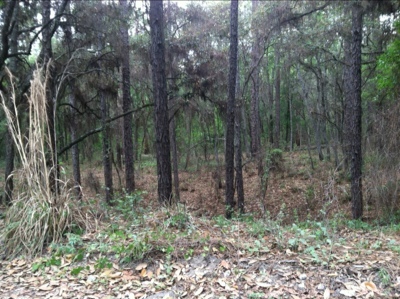 We took a break at a state forest trailhead. 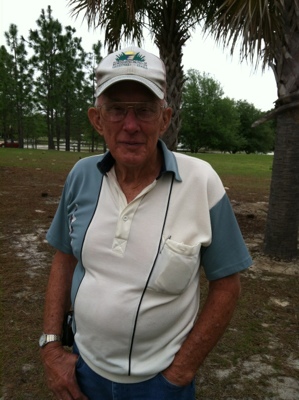 Mervyn “Buck” Lightfoot, one of the park hosts, admired the trike, and he and Jeffrey got to talking. Buck grew up about 30 miles from Branson, Missouri. He and his wife came to Florida a few years ago and never left. He told Jeffrey how he got his name (his mother had read a story about triplets named Marvin, Mervyn and Melvin), but all anyone ever called him was Buck. 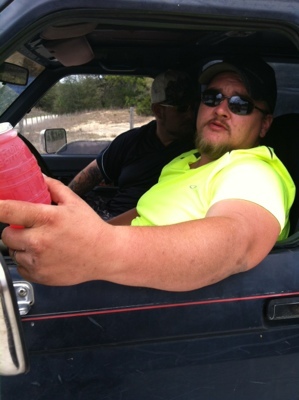 He described a motor home he saw at the trailhead, an enormous vehicle that towed an enormous trailer containing the owner’s business office and “toys” like a golf cart. Jeffrey told Buck about Human Rights First’s work. Buck thinks that’s fine, but is more worried about North Korea just now, and told Jeffrey (who gets little news on the road) about a couple who sailed to Cuba in the hope of retaining custody of their children, only to be returned immediately by Cuba to the U.S. The morning’s pavement was rough, and the shoulder had sand and gravel. Slow and unpleasant. Then for a while, we had the perfect combination of smooth new blacktop and a rumble strip separating the wide shoulder from the motor vehicle lane. And then it disappeared. 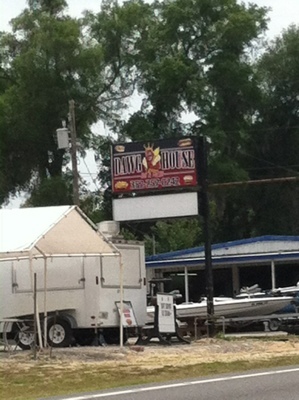 The sign says, “Dawg House”. It’s a hot-dog emporium. 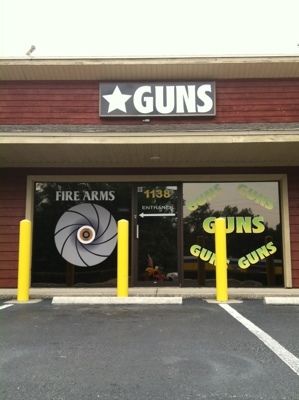 What do you think they sell here? Hint: the word appears 6 times on this part of the shop alone; there are 3 additional, similar shopwindow sections not in the photo. Look carefully and you’ll see Jeffrey reflected in the door. Suddenly, traffic picked up. Maybe the churches had let out. 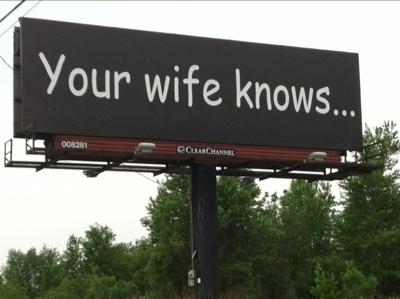 Or maybe it was the big gun show advertised on roadside signs. Aggressive drivers – still a minority – began to crowd the trike. When the GPS told us to turn off the main road, Jeffrey was happy to comply. 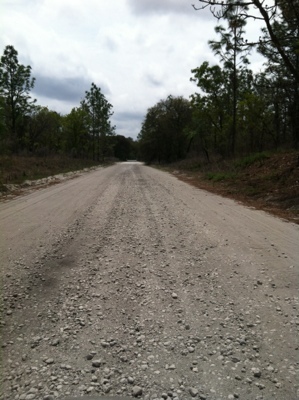 But soon we were directed onto a gravel road through the Withlacoochee State Forest. It was hard, slow going. A young driver passing by in a pickup truck convinced Jeffrey that braving the gravel was better than sticking with the highway. So we pressed on through the woods. After a few miles, the GPS said to turn left onto a sandy track. If we continued straight, we also would hit sand. Jeffrey checked his maps, saw no way out, and waited for the rare passing vehicle so he could consult a local. In a few minutes, these gentlemen showed up in a 4×4. 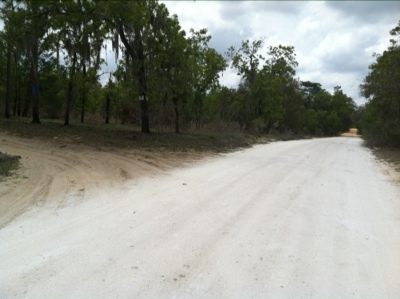 The driver told Jeffrey not to attempt the sandy road; it is soft sand, not gravel, for miles. He said we should go out the way the 4×4 had just come in, and we would hit pavement in about a mile. Jeffrey was grateful for the advice and was about to depart when the guys fished out a cold sweet bottle of lemonade and offered it to Jeffrey. (It was nearly 90F, about 32C, today.) Count on the locals to be prepared for all conditions! Jeffrey gratefully accepted the gift and drank it down in seconds. Right after we found the pavement, we found Phil (from Newark, NJ) and Chris (from Essex, VT). 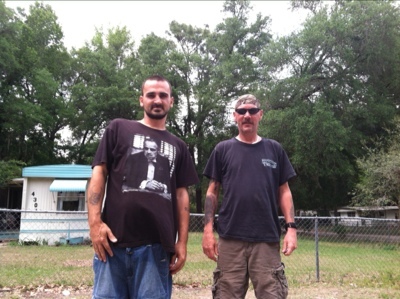 Both had moved to Florida to look after relatives. Both miss northern weather. They remarked at what the locals call Palmetto bugs: “They’re giant cockroaches!” Phil lamented the lack of mass transit. They had culture shock in the South. Imagine the culture shock of refugees from abroad! Back on the highway, several slow, hot miles beyond where we had left it, we encountered the biggest rolling hills of this Ride. 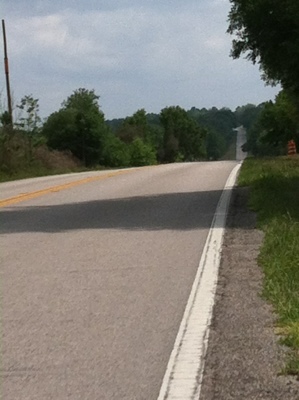 For about 10 miles, we had long steep rises and fast drops. 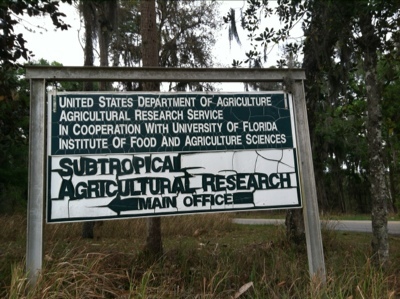 The land flattened again, we passed a USDA center at Chinsegut Hill (the name is from an Inuit word meaning, a place where lost things are found), and followed a mix of smooth roads (with a bike lane) and bad roads (crumbling, debris-covered, no shoulder, with high speed motor traffic) to within 4 miles of the Gulf of Mexico. We’ve run out of West. Now we go South. 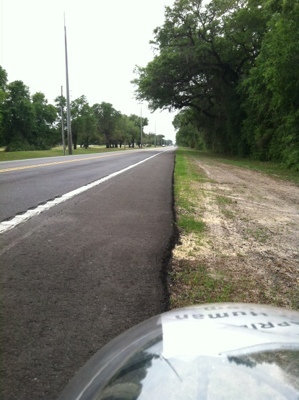 This entry was posted in Bicycle Touring, Human Rights, Immigration, Religion by Joey. Bookmark the permalink. Sending you You Atzmaut Smeach on the road! do you an Israeli flag with you? keep safe and keep up. following your entries every night and always wondering in what town and at which hotel/motel/home you and Jeff spend the night.